In celebration of the rotational presidency of the Visegrad Group -- also known as the V4, an alliance of four Central European states the Czech Republic, Hungary, Poland and Slovakia -- the Hungarian Embassy held the concert “European Quartet One Melody” at the JCC Art Center in Seoul on Wednesday. 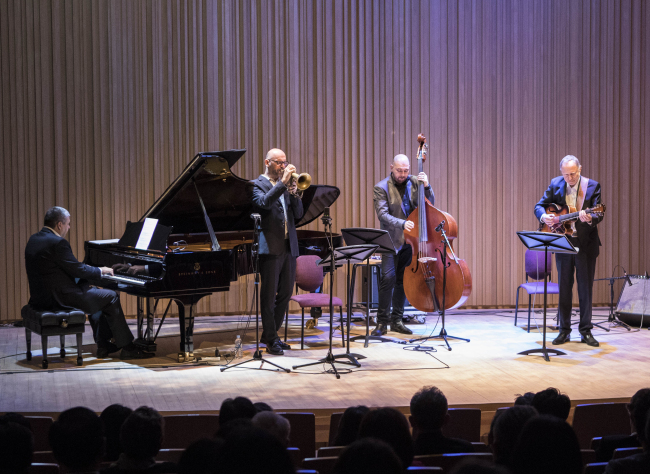 The Central European Jazz Connection, an internationally acclaimed quartet comprised of musicians from the four countries, played harmonized melodies. Hungarian trumpeter and flugelhorn player Fekete Kovacs Kornel, Slovakian guitarist Matus Jakabcic, Polish pianist Kuba Stankiewicz and Czech bassist Tomas Baros played their tunes as they have done in major cities around the world. The V4 group -- named after the historical Hungarian town, Visegrad, north of Budapest on the Danube -- was established in February, 1991, among the erstwhile Czechoslovakia, Hungary and Poland, with their collective aim of joining the European Union and North Atlantic Treaty Organization. Since Czechoslovakia split into the Czech Republic and Slovakia in 1993, the group became an association of the four nations. In 2014, Korea and V4 launched their “V4+ROK” cooperation mechanism -- part of the “V4+” channels between the nations and their major partners around the world -- encompassing political dialogue, social exchange, tourism, science and technology and innovation. Hungary has assumed the presidency since July 1.